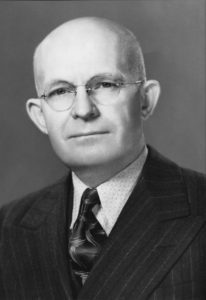 In the summer of 1941, Clarence Roberts, editor of The Oklahoma Farmer-Stockman, led the movement for the creation of Oklahoma Farm Bureau. Roberts convinced leaders of the Oklahoma Farmers Emergency Association that Oklahoma needed a permanent farm organization that could affiliate with American Farm Bureau Federation. The OFEA was dissolved and the membership invited to join the Farm Bureau. 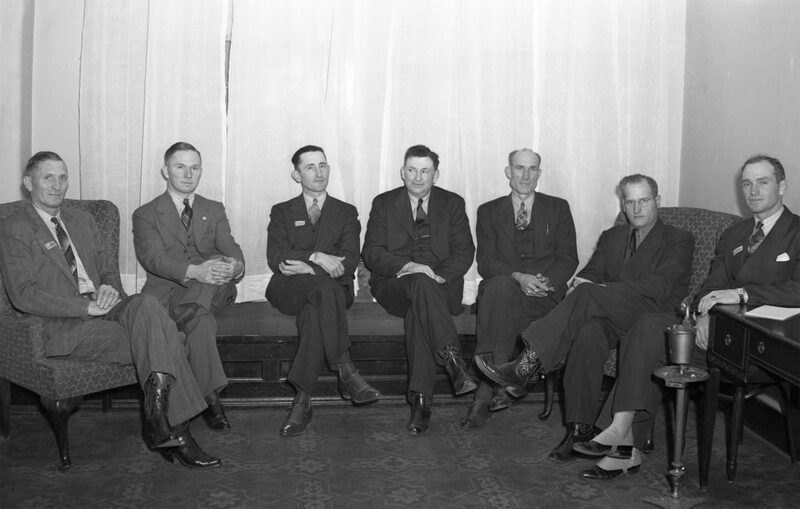 An organizing committee for the future organization took shape in a meeting in the basement of the public library at Ponca City on Nov. 15, 1941. Although the committee was responsible for getting the charter membership, Roberts stressed that the creation of bylaws, election of directors and other binding actions would be left up to the membership. “Why the Farm Bureau?” Roberts wrote in The Oklahoma Farmer-Stockman. “Because the American Farm Bureau Federation is the most aggressive and ably-led farm organization in the United States. Its membership is made up of business farmers. The Bureau’s program is an economic program, concerned with prices, savings, dividends–everything that makes up, or deals in, the economic wellbeing of farmers on the farm. “Farmers as a class never needed, as they need now, an airtight organization. It took a long hard fight to turn 5-cent cotton and 30-cent wheat into prices of today (14-cent cotton and 96-cent wheat). It is going to take a hard fight to hold them there,” Roberts continued. The organizing committee set a goal of enrolling 1,000 members in 20 counties with $5 yearly dues, not an easy feat for an organization without established leadership or policies. A larger obstacle for the fledgling organization was the economy. To put the situation into perspective, that $5 in 1942 would be about $76 in 2016. After the official creation of Oklahoma Farm Bureau, leaders had an uphill climb to create a functional grassroots organization, but they did not waste time. State board meetings were held each month to review progress, direct the membership campaign and any other issues related to OKFB formation and long-term goals. The first Oklahoma Farm Bureau office was opened in the Livestock Exchange building. The first budget was created, copies of bylaws and articles of incorporation was sent to county officers, AFBF publications were distributed with suggested OKFB goals. The organization even had a booth at the State Fair of Oklahoma in 1942 to gain more public exposure. Within the first few weeks after the historic first meeting, OKFB directors had appointed an insurance committee, which quickly contacted Kansas Farm Bureau Mutual Insurance Company. An arrangement was made the following year to allow OKFB to offer insurance coverage to its members. One of the first legislative acts of the organization was to contact the Oklahoma congressional delegation with delegates and members approval of parity pricing legislation that would enable farmers to realize their fair share of the national income. The first regular OKFB convention was held in the Huckins hotel in Oklahoma City Nov. 4-5, 1942. The first resolutions were created with highlights on their dedication to help win the war with highest possible production goals and the endorsement of the parity principle for agriculture. There was also a notable appearance of a new OKFB leader at the first convention: Dan Arnold, a popular and enthusiastic motivator who promoted Farm Bureau membership in every corner of the state. He was appointed executive secretary. As 1943 rolled around, OKFB was in full force. The second convention led to the adoption for 31 resolutions. OKFB President John I. Taylor and Secretary Dan Arnold made the organization’s first legislative effort to removed sales tax from feed, seed and fertilizer. Although this attempt failed, the first sales tax success came 14 years later in 1957. After forming the organization, the women began their first session discussing programs that could help Farm Bureau and their counties. By the start of 1944, the organization had several goals set, such as setting up a Farm Bureau organization in each county, completing Blue Cross signup, starting a public speaking contest, urging more active participation in Farm Bureau activities, aiding Farm Bureau membership drives, setting up scholarships for 4-H and FFA youth, sponsoring extension and vocational agriculture programs and to help public schools conduct health clinics. In 1945, OKFB had expanded enough to outgrow their small office in the Livestock Exchange Building. To accommodate this expansion, the organization moved its headquarters to 716 West Grand, which was later renamed to Sheridan Avenue. Oklahoma Farm Bureau Mutual Insurance Company, Inc., launched their charter policy campaign May 1, 1946 with a goal of 1,000 charter policies and $100,000 insurance in force by Aug. 1, 1946. At the time, OKFB had 90 agents in 30 counties writing 200 policies a month. In an effort to encourage the involvement of young people, the Associated Women worked to form a Rural Youth Group. They invited youth to the 1946 state convention, which led the 47 attendees to create their own organization: the Junior Farm Bureau. The organization continued to grow over the years, and its members became actively involved in many areas of Farm Bureau. After the organization’s success in selling car and truck insurance, OKFB created a mutual company to also provide fire insurance in 1947. By the end of year, Oklahoma Farm Bureau Mutual Fire Insurance Company had commended business with surplus funds of $121,350. A couple years later, members approved a resolution to merge casualty and fire insurance into on entity. As Oklahoma Farm Bureau grew, early leaders recognized the need for a publication to effectively communicate with members across the state. After moving to the 716 West Grand location, OKFB started regularly publishing a four- or eight-page newsletter to include information about legislative actions, OKFB gatherings and events, and tips on selling OKFB memberships with other farmers. In 1949, OKFB began regular publishing of the Oklahoma Farm Bureau Farmer, a 24-page magazine. In October 1948, the Oklahoma Junior Farm Bureau affiliated with the National Rural Youth of the American Farm Bureau Federation. The biggest legislative boost in 1949 was the recodification of state laws on agriculture.